One more day in Kiel, then on the road to Garda. 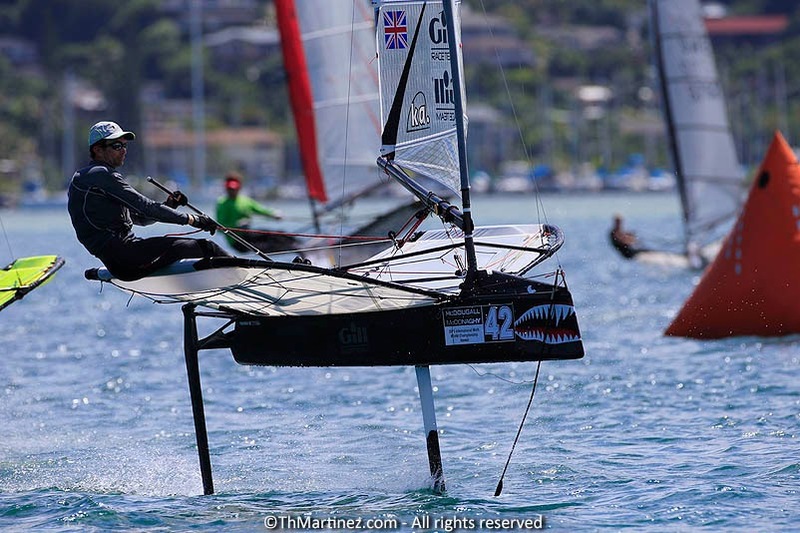 Still haven't sailed my boat, so Worlds prep looking good! Not! Got all the fittings on now, and had the rig up, but not had the whole thing rigged, ie tramps and rig and foils all at once yet! Rain has prevented much boat work, and no wind has prevented sailing. A very long protest for one of my squad this evening didn't help matters either! Looking fwd to getting down there though. It will be so nice just do do some sailing rather than watch other people! Rain rain and more rain! Kiel has once again remained true to form, raining every single time I've come here! We had 25 - 29 knots yesterday, with numerous big downpours. No sailing but got the boats in, took the rib outside to check the conditions (and came back in rather quickly!) and registered. It continues to rain today and the forecast is for rain for the next few days. So the weather gods are doing their best to ensure I can't get any work done on my Moth. 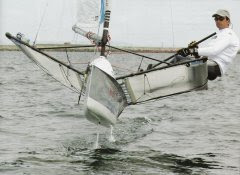 The round robins being held up in Valencia from no wind didn't help matters, and now it is rain in Kiel! Oh well, I hear it has been raining in Garda too! Got to leave for the ferry in half an hour so I'll keep this brief. While Rohan is training in Garda, I'm still finishing the new boat.... Not quite ideal champiosnhip preparation, but then I knew it would be a push once I'd signed up to be involved with the AC, and I couldn't really turn that down. The new boat GBR 4098, 'The Weapon' is just about there, I've just got to get the last fittings on, and I'll do sea trials in Kiel, Germany. So far the boat has done miles. 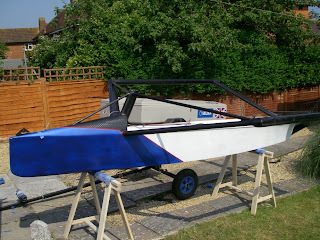 The shell was built in Weymouth at Full Force, then I took it to Exmouth to start my mods, then it went to Valencia, where the wingbars were made, and the deck put on, then it was back to the UK, and my new house in Weymouth for the final push. I'm now coaching in Kiel for a week, so I'll try and do the finishing touches to it in the evenings there. I'm getting pretty used to the late nights and early mornings on it. That is certainly a lesson from the AC - I seem to be able to survive on a lot less sleep! 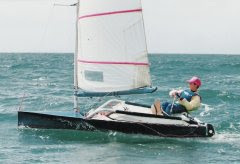 In summary 'The Weapon' is a modified Mistress 3, slightly less freeboard, smaller foredeck, aerofoil wingbars, new style gantry, and a fair bit lighter than my last boat. Nothing to radical, just lessons learnt from the last boat. Don't have time to implement too many of the new ideas on this one, but lots of interesting scribbles in the notebook! Full description soon. Paint job was very last minute. Looks okay from a distance, not so flash up close. Needs to be booked in for a proper sprayjob after the Nationals I think. Garda should be fun though, and I'm just going there for a bit of a laugh and will just see what happens in the racing.